body acceptance | Frances Ulman, Ph.D.
As someone who considers herself a feminist AND has enjoyed playing with different ways to glam up my mortal coil, I couldn’t agree more. Of course it can be hard to look cute if you aren’t finding clothes that fit your body type. That’s why I was very excited to come across a new blog for curvy girls that is one part body acceptance, one part fashion. Such a great mix! I hope she keeps it up! Okay, I’m not endorsing all the language used here. But with all the non-official authority I can muster I am endorsing Katt Williams as a self-compassion ambassador! Dear Eyes. You Are Being Lied To. Do your brain a favor. Go here now: Seventeen Mesmerizing Before After Photoshop Gifs. The Best is Not Good Enough? Not a Problem. Photoshop to the Rescue! These Photoshopped images are wonderful examples of how far the art of visual deceit has come. These are beautiful women with bodies that are closer to the ideal than most of ever had or will have. These women have the budget and time for healthy eating and a personal trainer. These women likely already started “ahead” with what genetics contributed. And as if these advantages weren’t enough, they are transformed by a team of stylists before a photo shoot. We never stood a chance of having a picture of ourselves look as amazing as these women. And yet being one of the most beautiful people in the world is no longer enough. Celebrities are routinely subjected to a virtual nip and tuck bonanza before their image ever reaches our eyes. Photoshopping: Now with More Deceit! Yes, already ample breasts are often enhanced. And already slim waists and arms reduced. But it goes so much farther than that. Pick any image and watch it flick back and forth between real and unreal several times. Look for the smallest changes that are being made. See Beyonce’s already slim face gets trimmed ever slightly more. See the lines removed from Megan Fox’s neck to make her skin look younger. See the one eye that is raised on Angelina Jolie to make her look more symmetrical. See Katy Perry’s forehead get reduced on the right side. See Faith Hill’s already slender back get trimmed along with her arm being reduced almost in half. On the second image of Megan Fox, see her already full bottom lip get plumped, and already seemingly perfect eyebrows get reshaped. It’s important to understand just what “Photoshopped” means. We aren’t talking about just adding a cup size or two in a bathing suit. Today’s Photoshopped images are a study of intolerance for human beauty. Cindy Crawford famously once said, “I wish I looked like Cindy Crawford.” Even she can’t meet the beauty ideal put forth by her own image. You are being lied to. Your eyes are one of the most important tools you have for taking in the reality of how things are. When I talk about using distress tolerance skills, I often suggest techniques using the senses, particularly the generally dominant sensory system of vision. I suggest using vision precisely because our senses are here to detect what is present and true. Turning our attention to the truth of the present can help pull us out of a looping internal narrative that is causing us pain. And so! Photoshopping images of bodies is a particularly dangerous way that our understanding of reality is being altered. Our brains trust that what it sees is true. It has virtually no defenses to prevent Photoshopped images being uploaded from our eyes to our filing system of “human bodies” in the brain. The repeated exposure to these images alters the file we have in our head of “human bodies.” We begin to look around us and notice “flaws.” But these flaws are only detection of differences between an unrealistic ideal that snuck into your head and the reality of beauty that surrounds us. So what can we do to keep ourselves from being hurt by these visual lies? Keeping our eyes shut at all times would certainly be 100% effective, but also probably impact our lives in other ways. (Move over texting while driving. Here comes Driving with Eyes Closed!). But when we see an image in advertising we can remind ourselves that it’s a lie. We can upload visual information of real bodies by looking at the diversity around us. Careful – our eyes loves to look for examples only of bodies that are “better” than ours in some ways. Choose to look around at ALL of the bodies that surround you. Young ones. Old ones. Different skin and hair and teeth and genders. Each body carrying around a person with hopes and fears and a desire to connect and be loved. And the same is true for you. You deserve to be loved, and to love your body for what it does for you in this moment. It will never be perfect, because perfect doesn’t exist. But your body is here now. Practice being grateful for what it does for you, and the beauty that exists in the uniqueness of you. 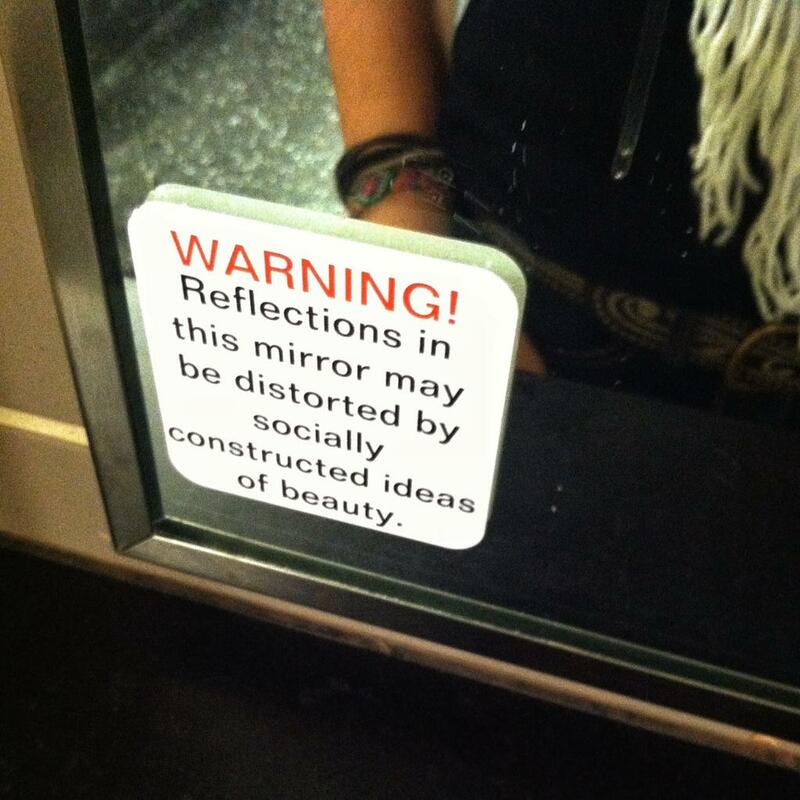 And for goodness sakes, don’t compare your body to a picture! 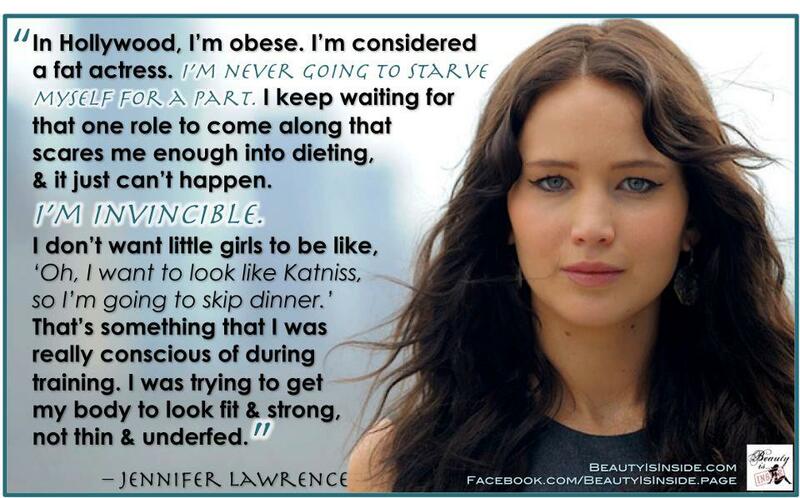 What a great way to start National Eating Disorders Awareness Week: Jennifer Lawrence is so unexpectedly fierce. She has said a lot of awesome things about loving her body, despite being considered “obese” by Hollywood standards. I loved watching her in this clip above. She is just being her goofy, relate-able, human self even when the environment pulls for outward beauty and the illusion of perfection. Jennifer Lawrence, you can be my wing man anytime. Find ways you can be involved National Eating Disorders Awareness Week here.